Make your life just a bit easier in the winter months by filling your freezer with soup! My favorite way to do this is by organizing a soup swap. Read on for all the details! Me! Me! Me! As long as I’ve got soup, I don’t care how long winter lasts. Friends, that is why I love having soup ready to go in the freezer. You never know when you’ll get snowed in and can’t make it to the grocery store. And the soup-making can be even more fun when you share it with a close friend or relative. Just organize a soup swap! My friend and I have done two soup swaps this winter, and I seriously look forward to doing it again next year! A soup swap is when you get together with some friends and make soup. At the end of the soup swap, everyone trades soups. You can invite as many friends as you’d like to your soup swap. However, I think that one or two friends is the maximum if you plan on making your soups together. If you plan to each have your soups completely ready to go before you meet, then by all means invite several friends to your soup swap. Before you do your soup swap, it’s important to be on the same page with your friends. 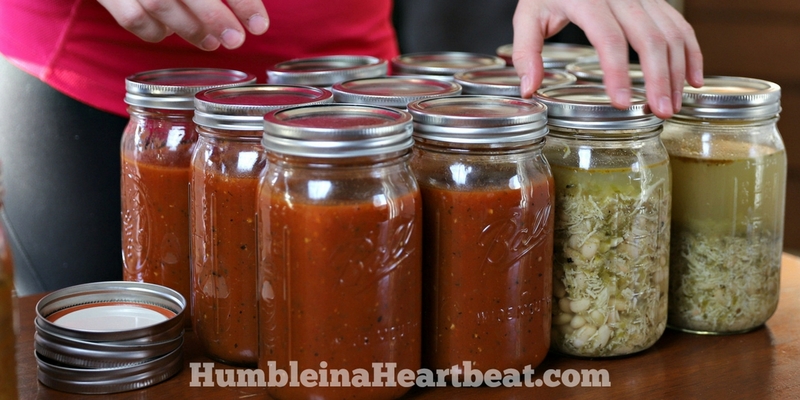 Let them know how many soups to make, as well as how much of each soup. When I do a soup swap I like to get 8 quarts of soup at the end. My friend and I agree to make two soups each, and each soup needs to make enough for at least 4 quarts. That way, we each get to take home four kinds of soup for a total of 2 quarts each. My family is small enough right now that we only need 1 quart of soup each time we eat soup. However, it would not be enough if we ate just soup with bread, for example. I have to make something besides the soup (like sandwiches or salad) for it to feed everyone. Because I only use one quart of soup each time, I have enough soup in my freezer to last 8 weeks if we eat one quart of soup each week. Why do a soup swap? There are several benefits to organizing and doing your very own soup swap. It all comes down to filling your freezer, socialization, variety, and following through on your commitment. 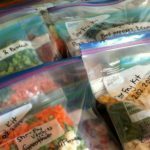 The main reason anyone would want to do a soup swap is simple: you fill your freezer so you can serve really healthy and quick weeknight meals to your family. But, come on, you can fill your freezer on your own. So, seriously, why do a soup swap? Here’s the deal. As a busy mom, I rarely get to socialize. And, when I do cook any given meal for my family, it’s a lonely task most of the time. So if I have the opportunity to cook with a friend, it feels more special. I get to serve my family while simultaneously catching up with a friend. 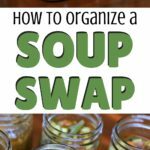 If socializing is an important part of why you want to organize a soup swap, make sure you give yourselves enough time to do that. Each time I’ve done a soup swap, I plan for at least two hours for us to make our soups and swap them. 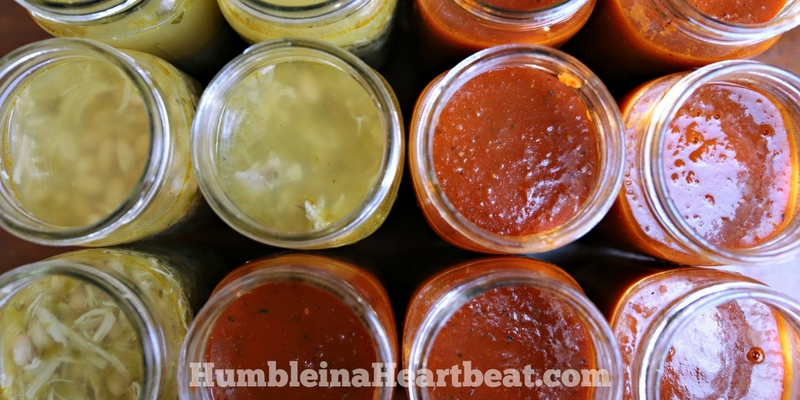 Another great reason to do a soup swap is for the variety of soups you get to freeze. I just love when my freezer has a variety of soup, because I’m not a fan of eating the same meal over and over. I doubt I’d be as excited to make four different soups by myself. Not only would I spend a good chunk of my day doing it, but that would just be a lot of ingredients and chopping to handle all by myself. Finally, a soup swap pushes you to actually get ‘er done. Both times I did a soup swap I think my friend and I both had thoughts of “maybe I should text her and cancel because I have so much to do today.” But because we felt committed to following through with what we had planned, we didn’t back out, and, in the end, we were both so grateful for all the soup we were able to freeze. The soup you choose to make is a very important topic to discuss before getting together for your soup swap. The biggest reason is because you need to make soups that freeze well. I have written before about what kinds of soups you should and should not freeze HERE and HERE. In general, leave out starches and dairy because those ingredients don’t freeze well in soup. Instead, you can cook starches separately and freeze in their own bag or container, or just cook them the day that you are serving the soup. When the soup is reheating, you can add any starches or dairy you left out. You also should know of any dietary restrictions and general standards that your friends have for homemade meals. Don’t organize a soup swap with a friend who likes to cook with a lot of cheese and meat, for example, if you are looking to fill your freezer with vegan soups. Also keep in mind which soups will go over well with your family, because you don’t want to waste soup. I believe in eating variety and trying new things, but I also know that you have to make sure your family is fed. 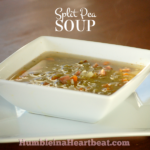 Split Pea Soup – This recipe is for pressure cookers, AKA the Instant Pot! Hearty Chicken Pumpkin Soup – Calls for heavy cream and cheese, so leave them out to freeze and add when reheating. Roasted Red Pepper Tomato Soup – I doubled this and had to make it in my crockpot because I didn’t have a soup pot big enough to hold it all! Leave the dairy out until you reheat it. Roasted Cauliflower Soup – I got this recipe from eMeals when I was doing a free trial with them, but since I can’t link to the recipe I have linked to a recipe that is pretty much identical. If I recall, I think I doubled this one, too, and I’m glad because it made just enough soup for 4 quarts. 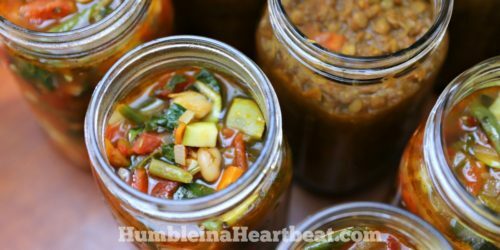 Homemade Minestrone Soup – Since this is a slow cooker recipe, I started making this a few hours before my friend came over for our soup swap. Leave out the pasta to freeze and add it when reheating. Also, make the sun-dried tomato pesto ahead of time. Oh, and I didn’t add the parmesan rind and it turned out tasting just fine. Lentil Soup – I doubled this recipe so my family could eat this for dinner after we finished our soup swap. I left out the lemon just because I feel like you should add that right before eating for a fresh taste. 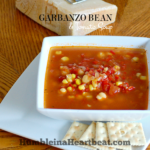 Tomato Basil Soup – This might just be my favorite soup of all of these. My friend made it and she added dried basil, but you could just as easily leave out the basil and add fresh basil right before eating. Also, don’t add any cream until you are ready to eat it. White Chicken Chili – My friend made this one, but she couldn’t find the right recipe she used to make it, so I linked to one that I made last fall and it froze very nicely. It also tasted really good. Only use one can of the green chiles if you have kids who don’t like spicy food. And leave out the sour cream and whipping cream to freeze it and add them in when reheating. Before getting together for your soup swap, you and your friend need to decide whether you will cook together or bring your soups already cooked so you can easily swap. I think the fun part is the cooking, but if you don’t have a lot of time you can totally get together for less than 30 minutes to do the swapping. In order to do a soup swap, everyone involved needs to have their own equipment and kitchen tools (unless the host wants to share their own equipment, of course). Both times I’ve done a soup swap, I hosted. My friend brought her soup pot, Instant Pot, mason jars, and immersion blender. I also had my own soup pot, a slow cooker, mason jars, a ladle, a blender, baking trays (for roasting veggies), cutting boards, and knives. Read through your recipes so you know what equipment you need to make your own soups. If you want to spend the least amount of time making the soup, be sure that each of you has your own cooking station. And make sure that there is enough room on the stove or counter (if using instant pot or slow cooker) so you can cook at the same time. 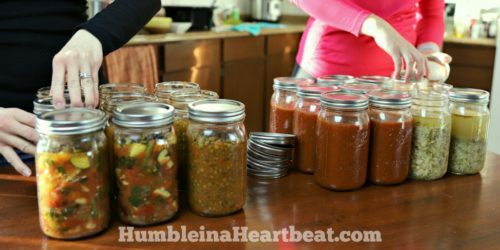 Once your soup has finished cooking, let it cool down for at least 30 minutes before filling your jars (or other storage method). 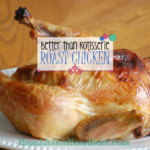 It’s even better if you can stick it in the fridge first to cool way down. But since you probably don’t want to spend all day doing the soup swap (or maybe you do…) you can fill your jars while the soup is still hot. 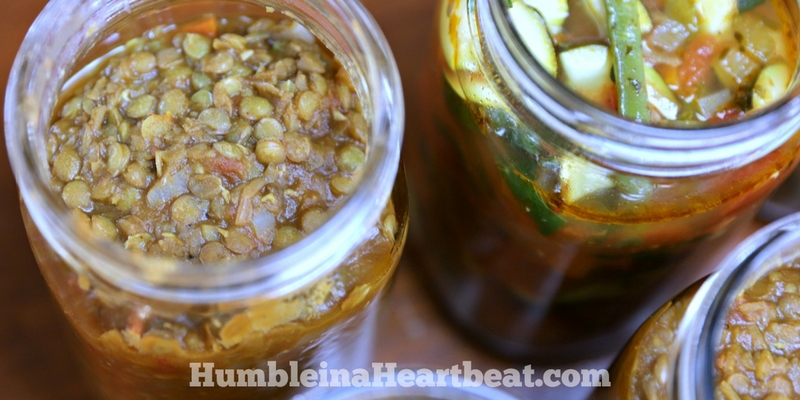 Just be sure to stick your jars in the fridge overnight before putting them in the freezer. What About Your Spouse and Kids? Cooking with kids (or a spouse) around can sometimes feel impossible, so if you are hosting, make sure you have a plan for all the people in your house. If your spouse can take the kids for the day, that would be the best option. 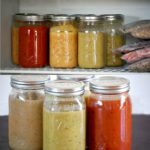 If you have young kids who take naps, schedule the soup swap around their naps and you won’t have to worry about anyone watching them. Unless, of course, they wake up! How Much Does a Soup Swap Cost? When you buy all the ingredients for your soups you will probably go over your grocery budget for the week/month. That’s to be expected since this soup will be feeding you 8 different times over two months. You might notice the second month of eating your soups that you are spending a little less at the grocery store since you have soup in the freezer already. You can make sure that your soup is cheap if that’s a concern for you. Just use simple recipes with ingredients that use in season produce. If you want to make costs even between you and your friend, set a budget for how much you can each spend on your soups so that nobody is spending too much. My friend and I didn’t really care what each other spent as long as we were making healthy soups. Don’t Let Your Soup Go to Waste! If you put your soup in the freezer and never let it see the light of day again, then of course your soup will be very expensive! There are at least two courses of action to take so you remember to actually eat your soup. First of all, before you put your soup in the freezer, it is a good idea to label each container. You’d be surprised how difficult it can be to remember what the soup is once it’s frozen. 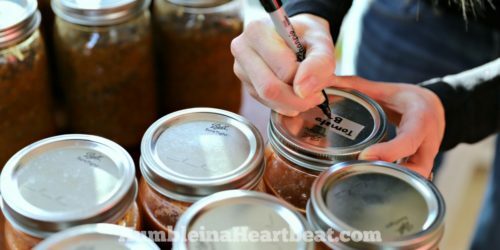 Whether you freeze it in mason jars or plastic bags, you can easily label your soup with the name of the soup and the expiration date. I like to use regular old tape on my mason jars so I can peel it off the lid and reuse the jar. Another way to be sure you don’t waste your soup is to write “soup” on your meal plan for the next 8 weeks so you remember to eat it. Just get out your meal plan for the next two months and write “freezer soup” on every Tuesday, for example. If you don’t have a meal plan like that, at least keep a note with your recipes or on your phone so you remember to plan for them. Then, at least two days before you’ll be eating a soup, take it out of the freezer and let it thaw in the fridge (that is, if you stored them in mason/glass jars). 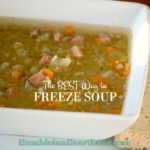 I am a big fan of freezing soup (if you can’t tell from all the posts I’ve written on it), and I want to share my knowledge with you so you can enjoy the many benefits of having soup in your freezer, too. Soup swapping can be a lot of fun. Not only is it a great way to catch up with a friend, but you get to fill your freezer at the same time. Plus, it makes the long winter months a lot more bearable! When my friend and I did our latest soup swap, we made a video! Check it out here or watch it below.